Aztec society had rich traditions of art and music and just like in other domains of Aztec life the influence of religion was always present. Great attention was paid on musical rhythms and sounds. But music was not used just for religious purposes but it was also used for enjoyment and entertainment in addition to it being a system of passing on the Aztec culture to future generations. Aztec children who were sent to school also learnt music and how to play various instruments as a subject. Nobles often had their own bands of musicians who performed for them. Music and dancing were also an integral part of Aztec festivals that were quite frequent throughout the year. Broadly speaking, there were three types of Aztec music. The first type was the sacred hymns reserved for religious purposes. These hymns praised gods and asked for favours such as success in a battle, rain, and a good harvest and so on. These hymns existed for all the important gods of the Aztec pantheon including Ometeotl, Tlaloc, Huitzilopochtli and Tezcatlipoc. The second type was the “cantras” which are also known as “ghost songs”. These were mystical songs sung during battle with trained singers and dancers taking part in the ceremony. These songs were accompanied by acting performances about human sacrifices, past battles, and the deeds of the Aztecs ancestors. The third type of Aztec songs was the songs of everyday life, including various romantic songs. The chief characteristic of Aztec music that was reserved for religious ceremonies was that of musical sounds, songs, and even dance movements which all had religious meanings. This music accompanied various religious rituals including human sacrifice. Interestingly, there was no word for music in the Aztec language and music was just the “art of song”. This simple Aztec music was almost always accompanied with singing. Another distinguishing feature of Aztec music was that it was also used in household worship for which various kinds of rattles and small whistle instruments were used. Music certainly played a very important role in the daily lives of the Aztecs. Whether it was a religious ceremony or worship at home, music was used. Other than that, music also accompanied their cultural festivals and ceremonies. At home, the common people had various whistles and rattles which were used in worship. Use of whistles were also made by hunters to attract game. At the temples, Aztecs had different hymns for different social groups and instruments like drums and large rattle-sticks were always played during religious rituals and sacrifices. Trumpets were sounded during sacrifices in order to announce the times of penance. Thus music played a very important role in the everyday life in both the private and public domain. Just like every other domain of Aztec life, Aztec music was also played on the battleground. This was particularly true for the Aztec warriors of the eagle and jaguar societies. These were noble warriors who gathered in the “houses of songs” and practised singing and dancing. On the battleground, these warriors used shell trumpets and whistles along with drums for signalling an attack or directing the movement of troops. There were many different kinds of musicians in the Aztec society. The most obvious type was of the priests who played music for religious rituals and sacrifices. There were many different kinds of musicians in the Aztec society. The most obvious type was of the priests who played music for religious rituals and sacrifices. 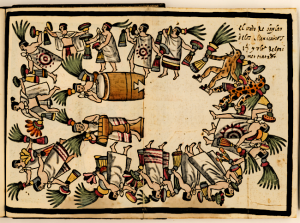 Ritual games, along with other activities, were performed during the ceremonies held at the end of every Aztec month of twenty days. Another type was performed by professional court musicians who had a permanent abode in the palace of the Aztec ruler. Music of large circular dances was popular among the court musicians and often hundreds of dancers took part in the entertainment. Court musicians also performed for the rulers during their daily banquets and for wealthy merchants during their private feasts. New chants and dances were created by these musicians in the honour of the ruler. The third type was of the noble warriors who gathered in the so-called “house of song” for singing and dancing. These musicians also played various instruments on the battleground. On the other hand, the most common percussion instruments of the Aztecs included drums of various types, rasps, shakers, and rattles etc. The Aztecs used a variety of musical instruments which included both wind and percussion instruments. Popular wind instruments used by the Aztecs included clay flutes, conch shell trumpets, and ocarinas. On the other hand, the most common percussion instruments of the Aztecs included drums of various types, rasps, shakers, and rattles etc. Drums were particularly important among the Aztec musical instruments and various types were made. The most famous type of drum was called “huehuetl” which was a large vertical hand drum covered with a animal hide cover. It produced a lower node at the centre of the drum head and a higher node near the outer rim. 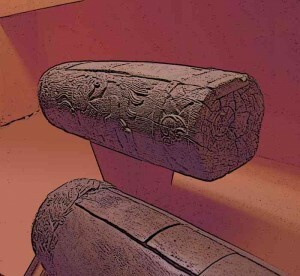 There was also a long horizontal drum known as “teponaztli”. It was made of wood and played with metals. Both these drums were important during the festivals and were played along with the Aztec songs. Musical instruments were considered sacred objects by the Aztecs and therefore these instruments were stored in temple sanctuaries and the palace. Some of the instruments were also adorned with gold and copper bells. Music was one of the most important components of Aztec life, private as well as public. The common people had instruments like whistles and rattles at their homes which they used for worship. In their public life, music was an integral part of religious and social festivals and ceremonies. Musicians were employed by rulers and rich people during their feasts and banquets. Musicians employed by the court were given a place to live inside the palace. Along with other musical activities, they were responsible of creating songs and dances in the honour of the ruler. 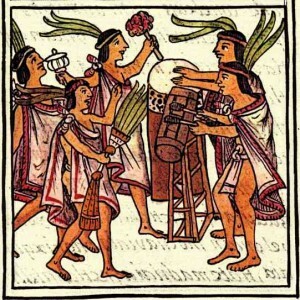 The Aztecs made use of a variety of musical instruments in which different types of drums were most important. Musical instruments accompanied the Aztecs even on the battleground where they used it for signalling an attack or directing the battle formations. Religious hymns were often accompanied by musical instruments, in particular the drums.